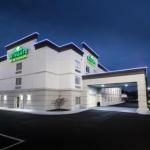 Complimentary breakfast Wi-Fi and parking mix in a locale less than six miles from the James Brown Arena at the non-smoking Wingate Augusta Washington Road by Wyndham. This three-story Wingate features 61 rooms with free Wi-Fi flat-panel HDTVs mini-fridges microwaves coffeemakers and desks. When morning hunger strikes guests can savor a host of treats on the complimentary breakfast spread. Kick up your cardio in the in-house fitness room and tackle last-minute work duties in the business center. On-site parking is free. The Wingate is surrounded by a host of dining options off I-20. In less than 15 minutes southeast guests reach the Augusta Riverwalk Savannah River and Augusta Convention Center. The Summerville Campus of Augusta State University hails less than four miles away. Games concerts and more take the stage at the James Brown Arena within six miles. The hotel is also within 14 miles of flights at Augusta Regional Airport.